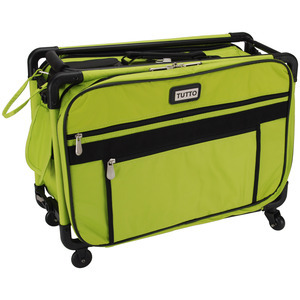 It can fit most sewing machines and sergers. Perfect for sewers, quilters, and designers. Choose color options from drop down above. The foundation of our product design is our patented luggage frame, which is sturdy, light, foldable, and 4-wheel based for superb stability. Tutto Machine on Wheels are great for transporting your machine to classes, retreats, trade shows and when traveling. The Tutto line is highly recommended by many famous magazines, newspapers and other media. Tutto product won the design award from Arthritis Foundation as well as the editor's choice and best product from the magazines. I had been searching for a carrying case for my new sewing machine, I was delighted when I found the large size on your site. As soon as I return home I plan to order the case for my embrodery attachment. Love the ease in the use of your site and your prices are comparable to other sites. Thank you for timely shipment, packing with all instructions included. Attention to detail and make or break any company. Don't change a thing! I got my bag yesterday. It's very nice. Worth every penny. Thank you for your courteous service. I would order again from AllBrands. I was impressed with how quickly I receiving my Tutto rolling tote. Unfortunately I ordered the wrong size for my sewing machine, so I had to return it. I have been corresponding with Jennie Watkins. She has been extremely helpful and following up with my on the return process. I ordered another bag, and again, the delivery was so quick. I have been very happy with my experience with your company. All I can say is when I go, my machines will be well protected. they are well made, easy to pull and you can stuff them full. you never have to leave anything behind and allbrands has the best prices, fast shipping and great customer service I have looked at these cases for years always wanting one, never seeing any specials at the quilt shows after searching the web for best prices and free shipping, allbrands prices CANNOT be beat. I am the envy of all the women in the quilting classes and embroidery too. I have the monster 2xl with arm bag and they fold down easily, the arm bag doesn't but the tutto rolling bag more than makes up for the size of the arm bag THANK YOU!!!!!!! All Brands exceeded my expectations in every way. Customer service with product selection was extremely helpful. The Tutto bag is fantastic, beautiful, alot of great features, and fits my JUKI HZLF400 with the case! Thank you. Tote arrived in 3 days instead of the expected 3 weeks!! Wonderful service and prompt email notifications. Thank you. Package received, and I am very pleased with the product. I will say that I was very impressed with the speed in which I received my order! My order arrived in good condition with no problems. I have since recommended your web site to another "quilters. "!